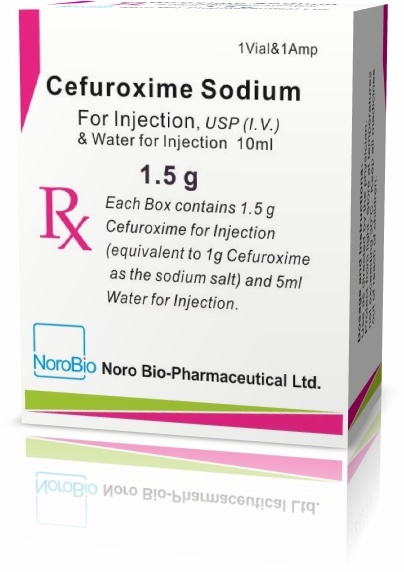 Each vial contains, as the active ingredient, cefuroxime sodium for injection equivalent to 250mg, 750mg or <?xml:namespace prefix = st1 ns = "urn:schemas-microsoft-com:office:smarttags" />1.5g of cefuroxime. Vials containing an off-white to slightly yellow sterile powder for solution for injection or infusion. Ear, nose and throat infections, for example, sinusitis, tonsillitis and pharyngitis. Urinary tract infections, for example, acute and chronic pyelonephritis, cystitis and asymptomatic bacteriuria. Soft tissue infections, for example, cellulitis, erysipelas, peritonitis and wound infections. Bone and joint infections, for example, osteomyelitis and septic arthritis. Obstetric and gynaecological infections, pelvic inflammatory disease. Gonorrhoea, particularly if penicillin is unsuitable. Other infections, including septicaemia and meningitis. Susceptibility of the causative organism to the treatment should be tested (if possible), although therapy may be initiated before the results are available. Usually cefuroxime is effective when administered alone, but when appropriate it may be used in combination with metronidazole or an aminoglycoside. Adults: Many infections will respond to 750mg three times daily by intramuscular or intravenous injection. For more severe infections this dose should be increased to 1.5g three times daily intravenously. The frequency of dosage may be increased to six-hourly injections, intramuscular or intravenous, giving total daily doses of 3g to 6g. Infants and children: Doses of 30 to 100mg/kg/day given in three or four divided doses. A dose of 60mg/kg/day will be appropriate for most infections. Neonates: Doses of 30 to 100mg/kg/day given in two or three divided doses. In the first weeks of life the serum half-life of cefuroxime can be three to five times that in adults. 1.5g should be given as a single dose or as two 750mg injections into different sites, eg, each buttock. Cefuroxime therapy is suitable for sole therapy of bacterial meningitis due to sensitive strains. Infants and children: 200 to 240mg/kg/day intravenously in three or four divided doses. This dosage may be reduced to 100mg/kg/day after three days or when clinical improvement occurs. Neonates: The initial dosage should be 100mg/kg/day intravenously. This dosage may be reduced to 50mg/kg/day after three days or when clinical improvement occurs. Adults: 3g intravenously every eight hours. No data is currently available to recommend a dose for intrathecal administration. The usual dose is 1.5g intravenously with induction of anaesthesia. For orthopaedic, pelvic and abdominal operations this may be followed with two 750mg doses 8 and 16 hours later. For vascular, cardiac, oesophageal and pulmonary operations this may be supplemented with 750mg intramuscularly three times a day for a further 24 to 48 hours. In total joint replacement, 1.5g cefuroxime powder may be mixed dry with each pack of methyl methacrylate cement polymer before adding the liquid monomer. *For patients on haemodialysis, a further 750mg should be given at the end of each dialysis session.